U.S. residents who wish to play online roulette, but do not have access to the state-run online casinos (currently offered by only two states, New Jersey and Delaware; Nevada offers online poker only) continue to have limited options. 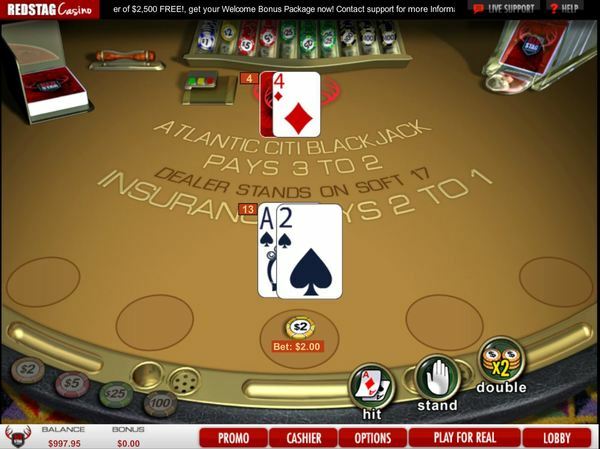 However, Red Stag Casino is a relatively new online casino that welcomes U.S. players that you might wish to consider. If you never heard of Red Stag Casino, it is understandable since the site has only been in existence since 2015. 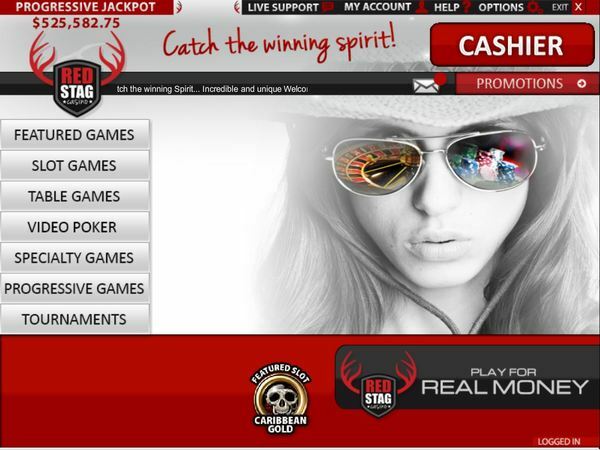 However, rather than being a complete newcomer to online gambling, Red Stag is owned and operated by Deckmedia, a firm with more than a decade of online experience. This is the same company that operates several other online casinos, including Uptown Aces, Sloto’Cash, Miami Club, and Desert Nights Furthermore, in its short time online, Red Stag Casino has received favorable comments from reviewers and players alike on its own merits. As with any online casino, we feel that certain features could be better. However, Red Stag deserves kudos for offering American players from most states (a handful are excluded) a safe online environment for playing their favorite casino games. The added flexibility of being able to access the games on any browser or on your mobile device, along with no hassle banking, are other plusses. Online casinos are open round the clock, so 24/7 customer support should be a given, too. Any site that offers any less is doing their customers a disservice, but at Red Stag Casino, you don’t have to worry about that. Any hour of the day or night when you have a question or concern, there are qualified representatives on hand to assist you quickly via live chat, phone, or email. English is the only supported language. Red Stag Casino is relatively small, which means that the emphasis is on the same basic games that most casinos offer, rather than unusual variations. However, it is a full service casino, so even though the 150+ slots take center stage, roulette players are not overlooked. 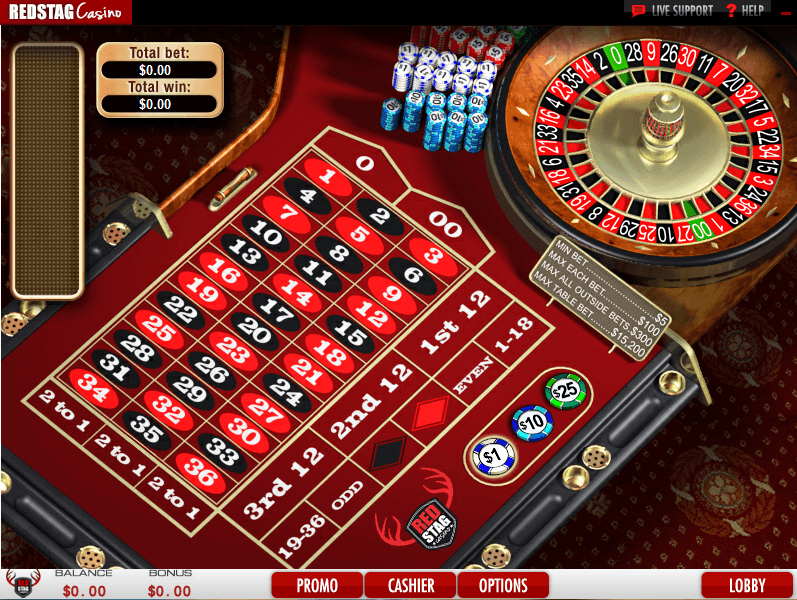 You can choose between the two most frequently played forms of roulette, American Roulette and European Roulette. Frankly, we were disappointed that this casino does not offer roulette players more variety. Roulette is the type of game that can become boring if played day after day exactly the same way. But the addition of enhanced features and extra betting options makes it fun and exciting, which is precisely why casinos catering to roulette players offer many choices. 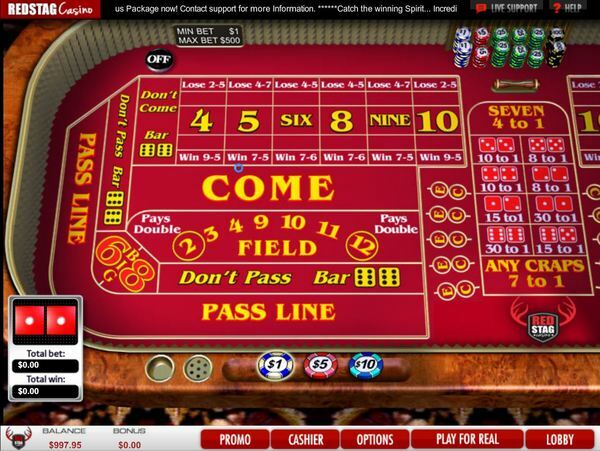 French Roulette, Multi-Wheel Roulette, Roulette Royale (with a progressive jackpot), and Double Bonus Roulette (with a special yellow section), and Live Dealer Roulette are examples of the kinds of games that some top online casinos offer roulette players. Perhaps at some point in the future Red Stag Casino will consider expanding its roulette options. Although roulette cannot be used towards clearing bonuses, it does count towards earning comp points. Offering special promotions exclusively for roulette players would be another nice touch. Meanwhile, the wide betting range accepted on both of this casino’s roulette games should satisfy the needs of most players. The minimum bet is $1 and the maximum is $100 on inside numbers and $300 on outside bets. However, you are strongly advised to limit your play to European Roulette with just a single zero on the wheel and 2.7% house edge and forego American Roulette with both a single and double zero and 5.26% house edge. Online casinos that accept American players are notorious for only offering a very limited number of banking options and, on top of that, taking an inordinately long time to process withdrawals. So it is refreshing to see that at Red Stag Casino, not only is the choice of banking methods greater, but the waiting time for withdrawals is also faster than the norm. Red Stag Casino is licensed and regulated by the Government of the Netherlands Antilles (Curacao). According to the website, the random number generators (RNGs) used by this casino have been found by independent auditors to be fair and random. However, we would have liked to see actual documentation of average payouts for the various games, and this information is not reported. Red Stag Casino is a safe and secure site; advanced encryption technology is used to ensure that every player’s account is fully protected. As a registered player, you are welcome to try the games for free to test the waters. Then, when you are ready to play for real money, you can take advantage of this casino’s generous bonuses and loyalty rewards. Keep in mind that you are not limited to playing on your own computer. The instant play flash casino works with any browser, or you can play on the go on your mobile device. >> Click to Join Red Stag Casino and Get Your Bonus!